To jumpstart an IoT project in your business, you need to understand how IoT technology works and what it can do for you. So you’re thinking about starting an IoT project. The question is: what do you build? How do you build it? Or what is an IoT project? Let’s start with that last question, shall we? An IoT project is the act of connecting any physical object to the Internet to collect and share data. How we use and share that data depends on the purpose of the IoT project. Whether you’re connecting windmills to monitor performance data or connecting machinery to monitor itself for breakage, the data generated from these projects can be used in a variety of ways. With the right hardware, software, connectivity, and know how, you can connect any object in the home, factory, or farm and stream data to the Internet. The Internet of Things industry gives businesses from every sector the opportunity to optimize their operations, develop new revenue streams, and enhance customer relations. According to a Gartner study, 60 percent of adopters predict IoT technology will transform their organizations, cut down on expenses, and generate substantial amounts of new revenue within the next five years. 40 percent of those adopters expect to see a meaningful payoff in just three years. However, companies that try to skip the research and development process and jump straight to deployment will fail to see optimal results. That’s because many companies work backward by imagining the connected product first, and then the value proposition. These IoT projects are hardly ever successful because the company never took the time to fully understand the problem they were trying to solve. In contrast, successful IoT projects first understand the day-to-day problems the customers and the business have and then imagine a connected product that can help solve those problems. After you figure this out, you can start to develop a feasible implementation strategy, set realistic goals and expectations, and streamline the deployment process. Like every other major business undertaking, this requires thorough planning and testing. This article proposes an actionable step-by-step process to thoroughly understanding how IoT can help your business and the ways you can get started building your first IoT project. What are the common use cases for IoT? (e.g., Preventative Maintenance, Asset Tracking, Environmental Monitoring, Remote Monitoring, Compliance Reporting, etc). And does your IoT project fall under one of these use cases? Can I create a business model around connectivity that justifies the recurring cost incurred by connected devices? What are the important technology choices and considerations I need to take into account? Preventive or Predictive Maintenance – You can connect your machines or equipment and receive alerts the minute something starts to go wrong. For example, Jacuzzi’s hot tubs are connected to the Internet and alert distributors and owners the minute something starts to go wrong. Asset Tracking – IoT technologies allow companies to monitor their constantly moving assets (like equipment or vehicles) in real time. With increased visibility, they can solve problems before they occur. For example, SafeTransport utilizes Particle’s asset tracker to give administrators the ability to track and monitor school buses in real time remotely. Environmental Monitoring – IoT sensors can be used for commercial farming, water monitoring, and more. By protecting valuable resources, companies can deliver recurring value for customers and their business. For example, scientists are monitoring real-time measurements of hazardous fumes like sulfur dioxide and particulate matter in Hawaii with connected sensors. Automatic Refillment – IoT technologies allow companies to automatically receive alerts when consumables elements (like fuel, oil, filters) are low, which allows them to forecast demand and more. Smart Metering – IoT devices track the energy, water, and gas consumption of buildings and homes, reducing operating expenses and improving forecasting. Consumer Upsell — Companies can create a high-end connected product and sell it at a premium. However, the product must introduce novel functionality or improve services that are valuable for the customer for this to work. These IoT business models have proven to help product builders and businesses make money with their IoT projects. Of course, you have to pair these business models with the questions in step one to create an IoT project that delivers continuous, recurring value for you and your customers. Before starting your IoT project, research the best IoT platforms, tools, and applications that could help you successfully implement your IoT product. Selecting the optimal framework is a critical part of an IoT project, and the right platform will be capable of growing with your business and adapting to future technological advancements. Hardware — Does the vendor offer any off-the-shelf applications, developer kits, or starter packages for the specific use case you are targeting? You will likely have to do some customization, but not having to start from scratch can save significant time and effort. Device Management — How does the vendor allow you to monitor, segment, and manage IoT devices that are out in the field? Connectivity — How well does the vendor’s network coverage fit your business’s current and future initiatives? Method of connectivity — What type of connectivity do you need? 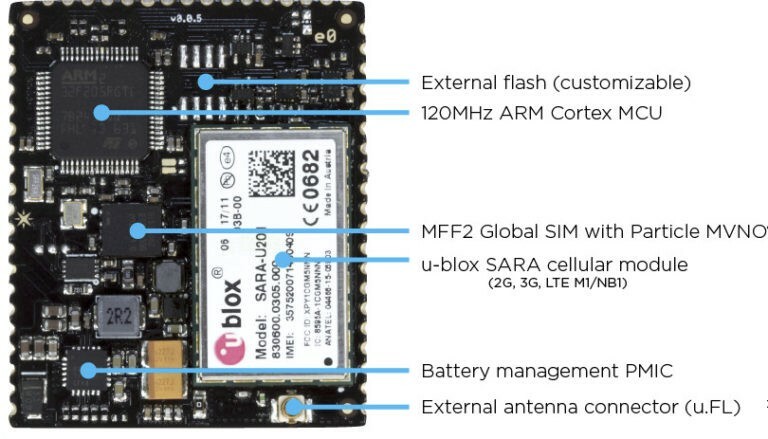 Do you need a Wi-Fi or cellular solution for your IoT product? You need to assess these needs and see how the vendor can address them. Geographic Coverage — Do they provide an embedded SIM with global support? Does the IoT platform cover the regions your business needs? Type of service — How does the IoT platform describe and sell themselves? Some services are purely connectivity platforms, while others are end-to-end solutions that offer the hardware, software, and connectivity. You need to assess what your business needs. How will your needs change over time? IoT development boards and modules are at the center of every IoT project. As IoT has developed, the variety and technical capabilities of these boards have only become more complex. When starting an IoT project, you’ll want to start with a simple prototyping kit, but as you progress through the hardware development and design process, you’ll need to invest in hardware boards that are designed for scaling. Development kits are breadboard friendly and optimized for expandability, modularity, and ease-of-use. As a result, they can be used for scaling depending on the use case and application, but maybe, it is best used as short-term PoCs in friendly environments. Intended use — Useful for iterating/prototyping hardware and firmware systems quickly. It provides a quick start solution and gets an IoT project rolling. Mass production modules are optimized for deployment in a mass production product, not for development. These are the real deal, intended for deployment for 5–10 years in hostile environments and small spaces. These products have little utility until they are soldered into your end product. For your IoT project, you’ll want to start with some form of a development kit to get your first prototype up and running. But after you’ve proven the concept, you’ll want to transition to production hardware, like mass production modules, to ensure long-period deployments. Can I validate the use case by accurately measuring the data I’m after? Which features and data are most important to the success of the initiative? What are the most expensive and challenging design requirements? Are there any features in the design that will go unnoticed and unused? Which demands does the design not satisfy and how problematic is that? Particle Community — Particle’s community offers a supportive team of IoT experts who can answer any of your IoT project questions and concerns. Hackster.io — Hackster.io offers a development community for learning and building an IoT project. You can take inspiration from the thousands of IoT projects that are listed on their website. Adafruit — Adafruit is the go-to place to learn anything about building IoT projects. They offer tons of resources, hardware, and guides to help you get started. StackOverflow — While primarily for programmers, StackOverflow has a large supportive community that can you help answer your IoT-related questions. This step is a little interchangeable and may need to be completed before you even start building your first prototype. 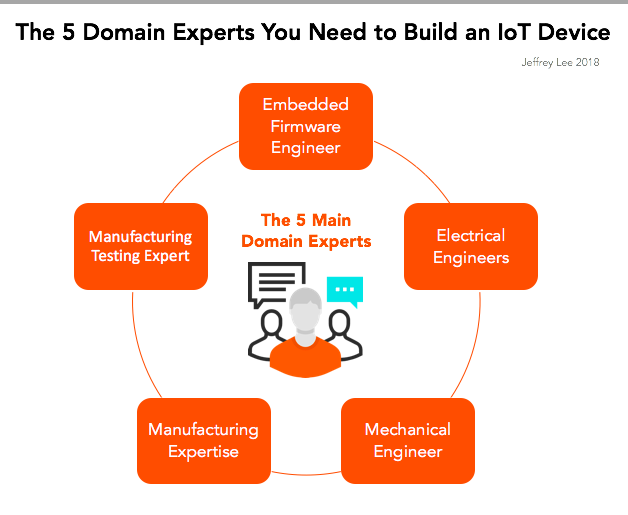 Regardless, if you’re planning to develop an IoT project at scale, you may need to find a partner or domain experts who can help you build your product. According to a Cisco survey (2017), over 60 percent of respondents admitted that they substantially underestimated the complexities of managing their own IoT initiatives. 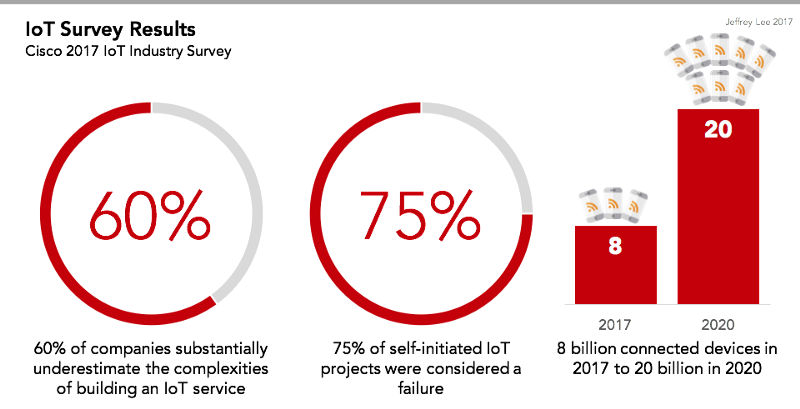 Even more alarming, the same survey also found that 75 percent of self-initiated IoT projects were considered a failure. However, the same Cisco survey found that most companies that consult IoT domain experts throughout the project’s lifecycle finish on time. Companies that go it alone often exceed their initial timelines and find that they lack the internal expertise to keep the project up and running. Unfortunately, by the time companies realize that they need additional expertise, they are deep into the development process, making pivoting exponentially more costly. Embedded Firmware Expertise: Embedded firmware engineers develop and implement the reprogrammable content (firmware) that runs on electronic devices. You can think of firmware as the operating system (OS) that allows embedded devices to perform its basic functions. A knowledgeable embedded firmware engineer can help you build a stable firmware architecture designed for constrained systems. Electrical Engineering Expertise: Electrical engineers design, develop, test, and supervise the manufacturing of electrical equipment. They are experts at DFM (design for manufacturing) best practices and can help you design a prototype PCB with the best-performing and least expensive components. Mechanical Engineering Expertise: Your mechanical engineer is responsible for the physical functioning of your device in the world, in terms of how it interfaces with other mechanical systems and, potentially, human users. Manufacturing Expertise: When deploying an IoT device to market, you need a manufacturing manager who can help you source and find ways to reduce hardware costs easily. Manufacturing Testing Expertise: Manufacturing testing is different than manufacturing expertise because implementing quality testing metrics is a job within itself. Successful IoT projects demand thorough analysis and in-depth planning. Companies that do not do their research and implement sound deployment strategies will face many challenges and complications, leading to unsatisfactory results. To jumpstart an IoT project in your business, you will need to understand how the technology works and what it can do for you. Each industry is best served by a unique set of IoT applications and tools, and a good IoT technical partner will help you determine your particular needs, define your expectations, and avoid the pitfalls faced by companies that attempt IoT deployment on their own.